Staff and customers at Sewell on the go have raised enough money to fund a Macmillan nurse for almost a week. 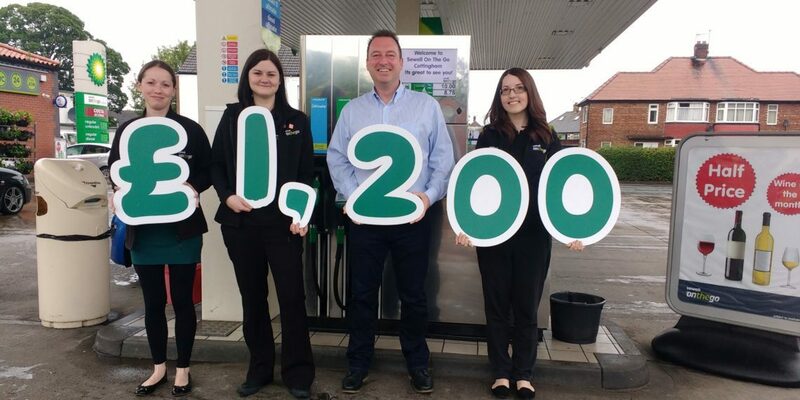 The leading East Yorkshire forecourt operator donated 15 pence from every hot drink sold in all of its 12 stores from May 5-13, as well as raising extra funds through collection boxes and staff fundraising games. The promotion raised £1,265.26 and marked the start of Sewell on the go’s partnership with the charity. Clara White, Area Fundraising Manager for Macmillan Cancer Support, said: “It costs £200 a day to fund a Macmillan nurse and the amount raised is absolutely brilliant. “We haven’t done anything like this in the area before and Macmillan is funded completely by donations, so to raise that amount in nine days is fabulous. “It was a complete team effort. I visited all of the stores and delivered collection boxes, staff games and information leaflets so staff could give customers support if they needed, or answer any questions they may have had about cancer. In East and North Yorkshire, there are 258 Macmillan professionals, with 56 in Hull alone, which includes physios, speech therapists, dieticians and GP advisors. In the East Riding, 2,197 people are diagnosed with cancer each year and 1,033 die from it. There are currently more than 57,000 people in East and North Yorkshire who are living with or beyond cancer, which is expected to increase to 110,000 by 2030. This means a 92% increase in cancer diagnosis within one generation. Sewell on the go, which has forecourts across Hull and the East Riding, previously raised money for Macmillan through its own coffee morning last year, raising about £200 before the partnership began. The recent hot drinks promotion, which included tea, coffee and hot chocolate, also coincided with National Beverage Day and International Nurses Day. Sewell on the go Managing Director Patrick Sewell said: “We set ourselves a target of raising £1,000, so to raise above and beyond this is fantastic and we’re delighted. “Our staff and customers really got behind Macmillan throughout the period and it’s a cause close to so many people’s hearts. “We’re looking forward to supporting Macmillan Cancer Support’s main coffee morning in September. “Sewell on the go supports many local causes and community groups, as giving back is something we truly believe in. One in two people are now diagnosed with cancer and more than 2.5 million people are living with cancer across the UK. More than £800,000 was provided by Macmillan in Hull and the East Riding last year to fund new cancer care professionals in the local health service.